Exhibitionists of the world unite. Calvin Klein has the perfect ad campaign to indulge your ego and sense of self expression. In the modern day world of overexposure, selfies and Instagram it was only a matter of time that someone adapted the old childhood curiosity catchphrase, "I'll show you mine, if you show me yours", into a slightly more grownup and risqué viral social media campaign. To kick off the multi-tiered campaign, Calvin Klein has enlisted celebrities and models alike, such as Miranda Kerr, Trey Songz and Lara Stone, to pose flashing the iconic waistband of the designer underwear brand and encourage thousands of others to follow their example with the hashtag #mycalvins. In this day and age it doesn't take much for people to show us their undies - what a liberated bunch we are in the 21st century. 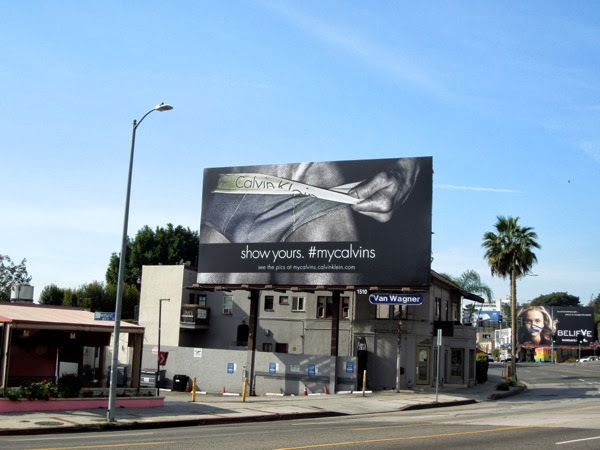 This provocative men's underwear billboard for Calvin Klein was first spotted along the Sunset Strip (and now you know why it's called that) on February 20, 2014. Daily Billboard doesn't know who the oiled-up gym-toned body belongs to in this billboard ad, but hazards a guess it may be Matthew Terry from their other recent high-profile underwear campaigns. If you like this, be sure to check out these other male and female Calvin Klein underwear billboards from previous years ad campaigns.